I’ve already posted about this in gratuitous detail over at the Three Steps Ahead blog, but just for redundancy’s sake, here they are. Click the images to read more about the wedding invitation and the save-the-date postcard. Our fantastically talented wedding photographer, Sakura Koontz, has posted a highlight reel of her shots from our wedding. Check them out here. 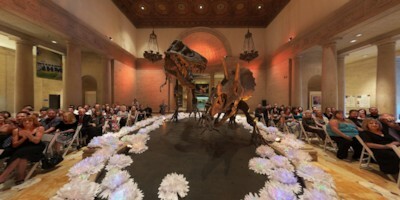 Our good friend Carel Struycken was kind enough to create a panoramic PictureBubbles° portrait of our wedding at the Natural History Museum of LA. Carel captured the moment beautifully—in 360° Dino Vision! Our LED paper flowers look especially vibrant in HDR.